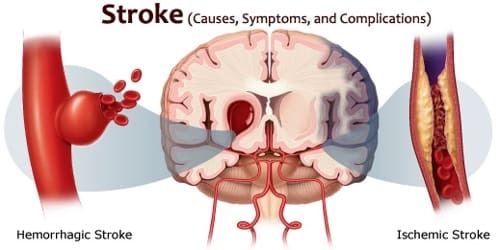 Definition: A stroke, sometimes called a “brain attack,” occurs when the blood supply to part of our brain is interrupted or reduced, depriving brain tissue of oxygen and nutrients. Within minutes, brain cells begin to die. A stroke is a medical emergency that needs immediate medical attention. A stroke can affect the way our body works as well as how we think, feel and communicate. 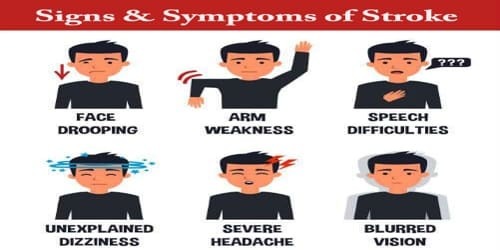 Signs and symptoms of a stroke may include an inability to move or feel on one side of the body, problems understanding or speaking, dizziness, or loss of vision to one side. Signs and symptoms often appear soon after the stroke has occurred. If symptoms last less than one or two hours it is known as a transient ischemic attack (TIA) or mini-stroke. Most strokes are caused by a blockage cutting off the blood supply to the brain. This is an ischaemic stroke. However, strokes can also be caused by a bleeding in or around the brain. This is a hemorrhagic stroke. 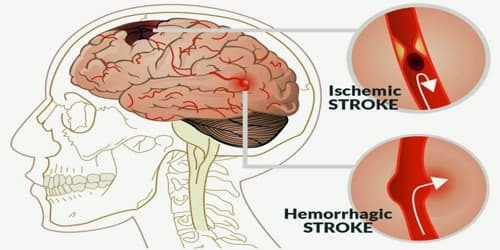 Causes, Signs, and Symptoms of Stroke: A stroke may be caused by a blocked artery (ischemic stroke) or the leaking or bursting of a blood vessel (hemorrhagic stroke). Some people may experience only a temporary disruption of blood flow to the brain (transient ischemic attack, or TIA) that doesn’t cause permanent damage. About 80 percent of strokes are ischemic strokes. Ischemic strokes occur when the arteries to our brain become narrowed or blocked, causing severely reduced blood flow (ischemia). The most common ischemic strokes include: Thrombotic stroke and Embolic stroke. Hemorrhagic stroke occurs when a blood vessel in our brain leaks or ruptures. Brain hemorrhages can result from many conditions that affect our blood vessels. A less common cause of hemorrhage is the rupture of an abnormal tangle of thin-walled blood vessels (arteriovenous malformation). TIAs are different from the types above because the flow of blood to the brain is only briefly interrupted. TIAs are similar to ischemic strokes in that they are often caused by blood clots or other clots. They should be regarded as medical emergencies, even if the blockage of the artery and its symptoms are temporary. They serve as warning signs for future strokes and indicate that there is a partially blocked artery or clot source in the heart. Stroke symptoms typically start suddenly, over seconds to minutes, and in most cases do not progress further. The symptoms depend on the area of the brain affected. 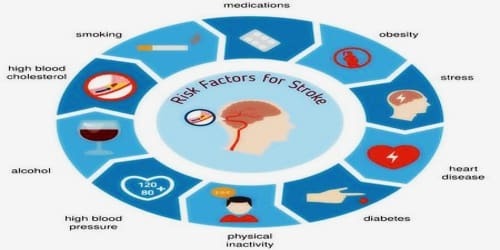 Risk factors and Complications of Stroke: The most important modifiable risk factors for stroke are high blood pressure and atrial fibrillations although the size of the effect is small with 833 people have to be treated for 1 year to prevent one stroke. Other modifiable risk factors include high blood cholesterol levels, diabetes mellitus, cigarette smoking (active and passive), heavy alcohol use, drug use, lack of physical activity, obesity, processed red meat consumption, and unhealthy diet. High levels of physical activity reduce the risk of stroke by about 26%. There is a lack of high-quality studies looking at promotional efforts to improve lifestyle factors.